Universal Studios president Ron Meyer and others plant trees at Griffith Park as part of NBC Universal's "Green is Universal" program. Universal StudiosPresident Ron Meyer got his hands dirty on Tuesday, all to help keep the planet green. Meyer planted trees at Griffith Park, along with Lauren Zalanick, president of NBC Universal's Women and Lifestyle Networks, and Los Angeles City Councilman Tom LaBonge. 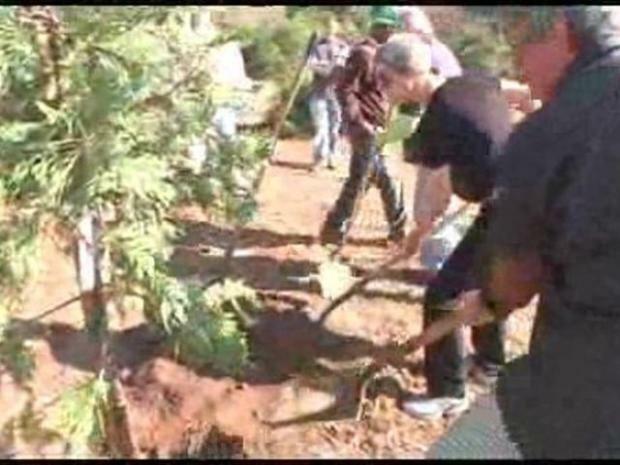 NBC Universal volunteers planned to plant 50 trees in Aberdeen Canyon to replace those destroyed in a fire two years ago. They also planned to clear a hiking trail, remove non-native invasive plants and provide mulching. Meyer and Zalanick were also on hand to give a $25,000 check to the LA Conservation Corps. Universal StudiosPresident Ron Meyer, NBC UniversalExecutive Lauren Zalanick and L.A City Councilman Tom LaBonge planted trees at Griffith Park as part of NBC Universal's "Green is Universal" Program. The Corps is the largest urban nonprofit conservation corps in youth and workforce development for inner-city youth and young adults. The NBCU Foundation provided the $25,000 to support LACC's Outdoor Adventure Program, which will allow experiential learning activities for 500 11- to 24-year-olds. Corps members will develop new skills; learn about the natural environment and ecosystems; gain knowledge of conservation and environmental issues and explore Los Angeles’ many natural habitats. NBC launched its "Green is Universal" campaign in May of 2007. "Green is Universal" is NBC Universal's ongoing environmental initiative dedicated to raising green awareness, effecting positive change to the environment, and substantially greening its own operations.